I was eagerly anticipating picking up a Nexus S this morning. It has good specs, it comes with Gingerbread installed, and it is destined to have first dibs on Android updates for the foreseeable future. Best of all, it comes “unlocked and carrier independent”, according to the official Google Nexus S site. 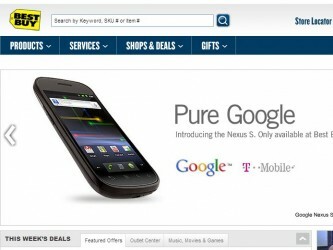 So I logged on to BestBuy.com, brought up the Nexus S page, and refreshed, anxious to see the “Coming Soon” button turn into an “Add to cart” button. Curiously, that didn’t happen. Instead, it turned into an “Add to Package” button. Okay, so I just have to move on to the next page and say I don’t want to sign up, right? Wrong. There doesn’t seem to be any way to buy this device online without a contract. So I hopped onto their handy support chat, and had this informative conversation. I especially like how my pal Gloria didn’t feel compelled to dignify that comment with a response. 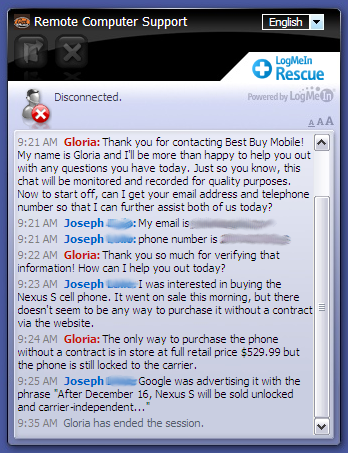 At the very least, Best Buy hasn’t made the details of the Nexus clear to its sales and support staff. At most, there is some seriously hinky bait-and-switch going on. As of this moment, I don’t have a Nexus S, nor have I ordered one. More on the situation as it develops. UPDATE: An intrepid staffer was able to conjure up a page with an actual purchase link via @googlenexus. So I’ve got a phone on the way. Thanks for making it challenging, Best Buy!